“As if we had been there”: this line guides us into Palestinian poet Ghassan Zaqtan’s newest volume in English, our presence remaining in the subjunctive mood. That we are as if there attests both to our own status—as readers of literature in translation—and to the displacements within history and memory given form in this poet’s magnificent work. In these poems, any event, any place, any memory bears the shadow of the subjunctive: of the history that didn’t occur; of what is no longer ours; of how relentlessly memory transforms presence into absence. This shadow—as if—defines what, in the light of any moment, we may know. The line quoted comes from the poem “A Swallow”: “As if we were together / as if we had been there / with the dead who are there / as if over there.” This stanza considers the role—the place?—of the poem: as if a poem could offer a togetherness that wasn’t, a presence that is no more, in a place lost then or now; even the absence of the dead isn’t here. In these swift lines, we glimpse the knowledge of the fleeting, of the less-than-present, to which Zaqtan’s work is dedicated. The Silence That Remains, Fady Joudah’s translation of Zaqtan’s earlier work—with selections covering 1982 to 2003—was published this summer by Copper Canyon Press. This is Zaqtan’s third appearance in English: Like a Straw Bird It Follows Me, Joudah’s translation of Zaqtan’s more recent work, won the international Griffin Poetry Prize in 2013. The two volumes illuminate one another, each helping us to read the other: the unsimple spareness of the earlier poems; the suggestive, expansive precision of the later, such as the gorgeous “Pretexts” or the long poem “Alone and the River Before Me.” Describing the Past, a novella translated by Samuel Wilder, appeared from Seagull Books in 2016—an intricately elusive narrative set in the Karameh refugee camp, where Zaqtan himself was a child, before its destruction by Israeli forces in 1968 (Zaqtan was born in 1954, in Beit Jala, his family refugees). 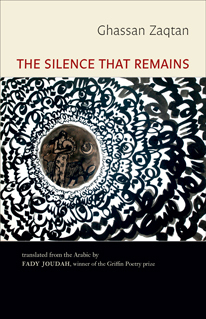 Joudah’s foreword to The Silence That Remains notes that some of the early books from which he translates are barely, if at all, available in Arabic, and the originals he worked from were already subject to Zaqtan’s later revisions and republications. Thus many poems included in this bilingual edition do not readily find reflections in any mirror, as Joudah compellingly puts it, but “[inhabit] an in-between space where silences are performed. A genome’s dance with its phenotype”; and so this work is “uncorrected, so to speak, by what would betray the silences it generates.” As readers of these poems in translation, their originals neither here nor there, we find ourselves then fully and only “as if we had been there”: a state that the poem both describes and embodies—its text steadying momentarily, in your hands, here, while testifying to its own absences, there, then, now. In other words, the line from the poem “The Stranger’s Song” that haunts me—“And something of life on the back of the hand / was narrating / forgetting”—at once describes life and text, each a form of forgetting, each eluding knowledge’s grasp. Throughout these poems, the call and response between here and over there, between now and then, seems to be echoed by a movement between touch and sight, as means to know what is close, what is far, neither knowledge quite complete. “A Swallow” concludes “as if over there // is as close as our habit / of not coaching our fingers to see / … and the villages / … wish they never were.” The final couplet doubles loss: the loss of the villages so great to bear in reality that it is wished preemptively into the subjunctive mood. War might take form as an aftermath that is also a future wound, displacing our bodies from themselves, via metonymy, and into harm’s way: “That was when we found our shirts taut / toward the enemies’ arrows” (“Old Reasons”), or in “Their Absence,” when “what remains” are “their shirts // banners that tug / only at trees // and are not retrieved / a triumph.” The only triumph is that the remnants of those who are gone may still be seen, these shirts the echoes of bodies that were here. “When the singers begin their slow departure / from refrains,” the poem “Night Watch” begins, and when may this be? To begin to depart from repetition is an instant nearly impossible to name. Here “refrain” carries wonderfully its two senses in English: a verb meaning to restrain, from to bridle; and a noun for what is repeated in song, evolved from a verb meaning to break off. So that in “refrain” breaking off now means resuming, recurring; and repetition bears an intimation of force. And when, the poem goes on, “they’re done with all that,” that is when “we’ll dig / a small time for us in rock / and hide our children’s toys in its palms, / hide all fragile things.” All this “before we go out to meet the raiding wave.” Here we hide our fragile things not from time, as one might expect, but in time, poignantly: it is only within time that one may know what is fragile, if only for the moment it lasts. And now we ride out, a we that will break against “the raiding wave”: from this battle some of us will not return; we find ourselves among “all fragile things.” The poem gives a sense that this night is itself a refrain; the raiding wave has come before and will come again. The question of who we are and what will become of us resonates, as in “Sign,” whose refrain serves to describe the exile that Zaqtan and generations of Palestinians have endured, as well as the exile from the past, singular and collective, that time ceaselessly enforces. We find ourselves changed, to ourselves and each other; the places we’ve been have changed us—“until,” the poem concludes, “we ended up here / in this chrysalis.” This conclusion reverses what had seemed to be the poem’s direction, leaving us not after but before a moment of change. We are changed until we reach the moment before change: a chrysalis. The poet’s reversal here is both playful and prophetic: change will not cease; each sign signifies its imminence. What’s here and now is already only as if here and now; again the present awaits a future in which it must know itself, changed. The phrase “on the sly” summons the question of how we, readers in English, enter these poems, through Joudah’s translation. Joudah’s agile chattiness and his ear for silence grant these poems both their spacious sense of absence and their quick presence; here the lyric subject moves through syntax like breath, vital motion more than stable center. One feels (I do not read Arabic) that phrases like “on the sly” may belong to this translator particularly, as might lines like “Your morning, that bird of slow talk” or “your house visitors are a bunch of tempters” (both from “The Stranger’s Song”), with the striking effect of these combined adjectives and nouns. Joudah often evocatively runs a word or phrase counter to idiomatic familiarity; or he asks that words bear the full burden of the multiplicity of their meanings. For example, the startling conclusion of “Stranger’s Song”—“Your lover’s window / has not slept / or overlooked you”—knows how “overlook” means both to ignore and to look down upon from above; both to see and to choose not to see. The tension between these meanings and the slippery negation (“not”) the syntax catches them in—inspiring and ending hope, turning the lover’s face away—deepens the absence of the lover’s gaze. Thus asked to receive, to read the echoes of silence, the reader hears again the words of “Not for My Sake”: “speech and its loads / are not mine / before me / all of it was.” In the face of the immensity of this task—to hear the silences of history and memory; to receive the speech that is not yours; to have survived, for now, as if for this moment, before the text—the poem refuses to leave us alone. The poem offers its voice. “You have no clue,” the poem “The Lover’s Song” begins, “I visit you every night / to tell you my latest dream // Together we sit.” Together poet and reader watch someone else watch over the dead: “The song isn’t ours / the fire in the plains not ours, / someone’s guarding the dead there.” Of course this moment is yet another as if, the poem presenting a dream it insists we visit each night, escaping and returning together, as if we could ask of one another, as if we could ask of the passing form of the text: “Life passed / don’t / leave me here” (“A Voice”). Hilary Plum is the author of the novel Strawberry Fields (2018), winner of the Fence Modern Prize in Prose; the work of nonfiction Watchfires (2016); and the novel They Dragged Them Through the Streets (2013). She teaches creative writing at Cleveland State University and serves as associate director of the CSU Poetry Center. With Zach Savich she edits Rescue Press’s Open Prose Series.